It's lovely to follow a sense of purpose and continuity in an artist's work. Barb Jungr has long been one of our finest jazz vocalists, but to my mind her talent and instincts for putting together an astonishing collection of songs are now unerring. 'Shelter From The Storm' - album and show - is her latest thing of wonder. One of the reasons the new record is so satisfying is that it seems to tie together various threads of Barb's recent work, acting as a kind of unofficial sequel to about four recent projects, while still finding a new direction (so, a perfect place to jump in, then take off!)... Brilliant at finding the nerve centre of songs - particularly by men, stripping away any masculine bravado to expose the raw sensitivity beneath - Barb made a magnificent record in 2010 called 'The Men I Love', where her 'new American songbook' featured songs by Paul Simon, David Byrne and Todd Rundgren among others, including two hugely important figures in her discography: Bob Dylan and Leonard Cohen. Then came 'Stockport to Memphis', an eclectic selection (from Sam Cooke to Joni Mitchell) but crucially, featuring some imaginative and infectious originals, written with pianist/arranger Simon Wallace. The pair also collaborated on the follow-up, 'Hard Rain', devoted to Dylan and Cohen protest songs - an uncompromising, unashamedly political programme with its steel softened by the unfailingly creative arrangements (if you thought it was impossible to hear 'Blowin' in the Wind' as if it was new - think again). Then, most recently, she collaborated across the pond with another master arranger, John McDaniel, for 'Come Together' - an evening of Beatles songs, again, re-imagined and reshaped not only by B's feminine perspective but J's US angle, ensuring that the song selection wasn't too obvious (all hail the White Album!) and the covers were respectful but never too reverential. I'm feverishly hoping they bring those interpretations to disc at some point. Well - that was an early digression! But 'Shelter from the Storm' is in some ways the strong-willed, slightly rebellious offspring of all these forerunners. More than anything, the album artwork/typography suggests this is 'Shelter' from the 'Hard Rain', that album's bleak content now answered by the new record's subtitle 'Songs of Hope for Troubled Times' and the dark interior now opening out into a leafy park. 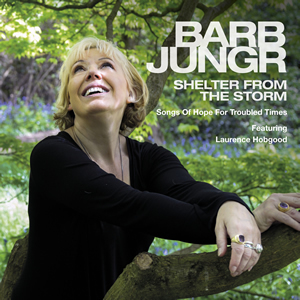 However, the album ranges across an even wider choice of covers than 'The Men I Love' - with showtunes nestling in among the more brittle, modern entries - and, more good news, Barb is back writing again, with a new American collaborator and piano magician, Laurence Hopgood. The band also rev up Joni Mitchell's 'Woodstock' in what must be one of the record's stand-out tracks. Again, I sense a little mischief as the song opens with graceful solemnity - I'm hoping it won't spoil it for you too much if I say that you can expect a gear change or two, leading into an addictively funky groove that restores an air of celebration to the song, however temporary. I love the way that with L's use of different keyboard sounds, matched by B's varied, virtuosic vocals (with the occasional nod, I *suspect*, to JM - 'staaaaaaaaaar-dust!' - but always retaining her own uniquely rich tone) - you do also get a sense of different bands mashed up, following each other, chasing the same tune. But any playfulness never over-rides the album's sincerity, and fundamentally good heart. The programme on the album must have been very carefully worked out, and is - to me - utterly emotionally true. For example, the artists' roving eyes for material demonstrate that whether you go all the way back to the 'first' great American songbook or come closer to the present, human longing has been a constant. The opening selection is an inspired 'Bali Hai' - stripped from its 'South Pacific' context and re-cast in this small band setting, the song acquires a lighter-footed, sinewy 'oomph', while staking its claim as a universal anthem of belonging. I was also struck by the inclusion of Bob Dylan's 'All Along the Watchtower' and Peter Gabriel's 'In Your Eyes' as a single song, with verses for each woven around each other. An inspired move, musically for sure, to see how the backbones of both could be fused - but also neatly symbolic of the album's collaboration between UK and US artists. It's also fascinating to hear how the mythic elusiveness of the Dylan lyric is punctured by Gabriel's emotional directness: sometimes you just need to get to the heart of the matter. As you've probably gathered, 'Shelter from the Storm' is not without melancholy: it understands that by definition, hope is always for something yet to come. But track by track, it shows us how to cling on: through optimism, humour, love, resolution and strength. Hope and jazz do, in fact, have this in common, don't they? - the journey is what sustains you, even if you can never know what's coming next. Live, 'Shelter from the Storm' is all you could want from a gig - the already-brilliant album material given a generous blast of nuclear-powered energy and intimate focus. (I was at one of the recent London dates and was happily overwhelmed!) The initial run of UK performances is nearly over - although in early April you can still make Corby or Portsmouth. However, as you can see from Barb's epic live dates webpage, she keeps several of her programmes alive at any one time, and it's sure to be back. In the meantime, you can buy the album here. Visit the Linn website anyway, because there are two extra tracks waiting for you that you can download for free. They do fill out the overall picture - Bacharach & David's 'What the World Needs Now is Love' is a suitably soulful addition, plus an indispensable version of Springsteen's 'Long Walk Home' (again, a personal favourite - I sometimes feel I might be a bit out of step in my affection for the 'Magic' album), the most recent song covered in the project, and fitting the theme like a glove.